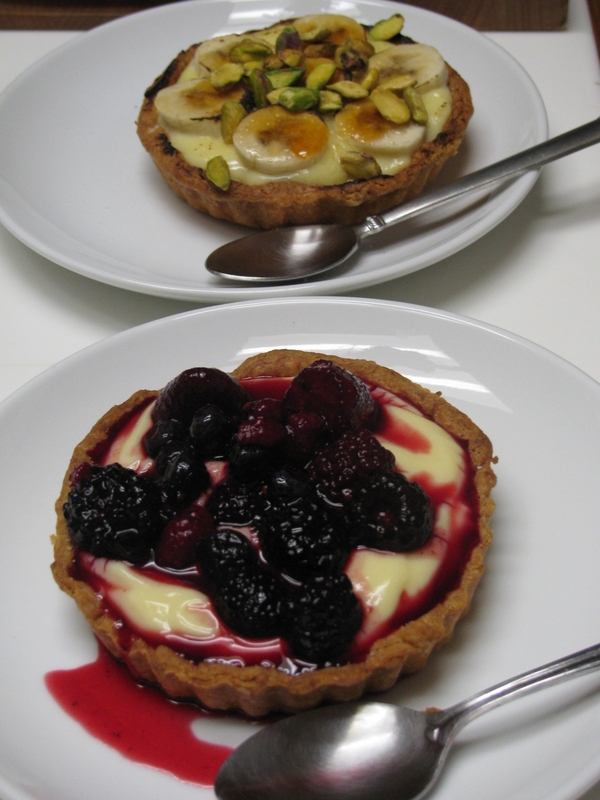 Delicious tarts cobbled up with what I had in the pantry and fridge. The dough is a simple 3-2-1 (flour-butter-liquid) with egg yolks making up half of the liquid and ice water the rest. I also added some vanilla sugar for flavor and to help brown the baked pastry. I baked them blind till completely cooked and crispy/flaky. The filling is basic pastry cream made using the solid recipe from Dorie Greenspan’s book “Baking: From my Home to yours“. I love banana pies, Diana does not. So, hers was topped with a mixed berry sauce (frozen mixed berries cooked briefly with sugar and chilled). 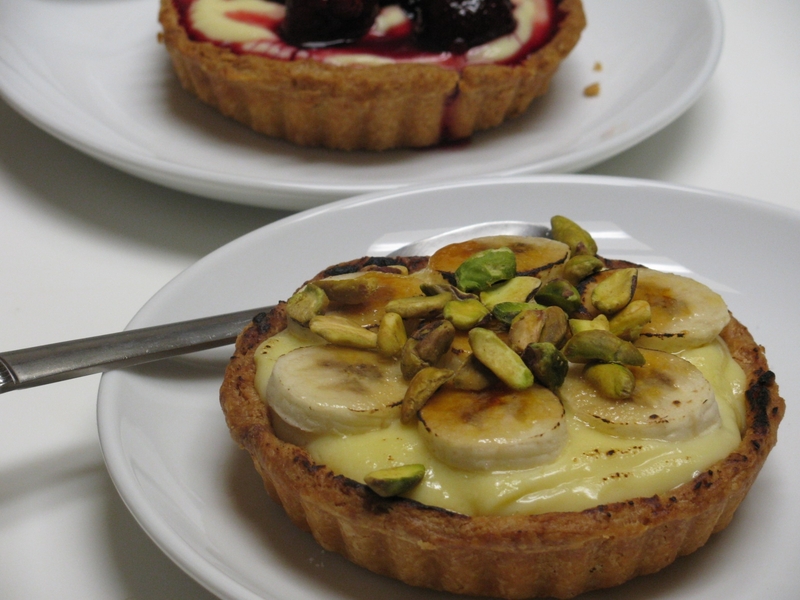 Mine was filled and topped with banana, sprinkled with sugar and caramelized with a torch then sprinkled with pistachios. Well, not exactly, as in my own book. However, I’m in the next best thing. One of my recipes made it into Paula Wolfert’s latest tome, “Mediterranean Clay Pot Cooking: Traditional and Modern Recipes to Savor and Share“. Paula also included a very thoughtful introduction to the recipe in her inimitable style. I first “met” Paula online via eGullet.org years ago. We never met in person, but we exchange emails frequently and spoke over the phone a few times. When Paula needed testers for the updated version of one of her books I was happy to help. A few years back -yes, she takes her time with the books and it is worth it- Paula mentioned that she is working in a book about clay pot cooking and she asked if I have any unique traditional Lebanese recipes that would benefit from cooking in a clay pot. Two recipes immediately came to mind, both, as far as I know, are not only unique to Lebanon, but unique to the northern part of the country where I come from. 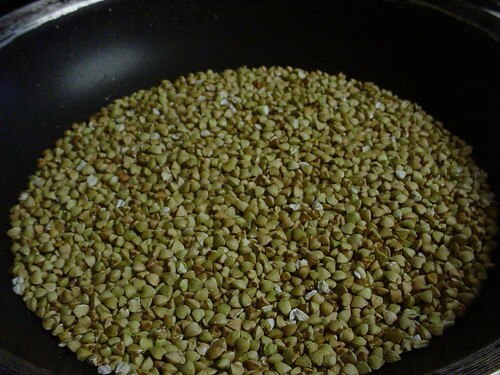 The first recipe we talked about was that of “Makhloota“, a thick soup made with various legumes and grains. It is served warm or room temperature. 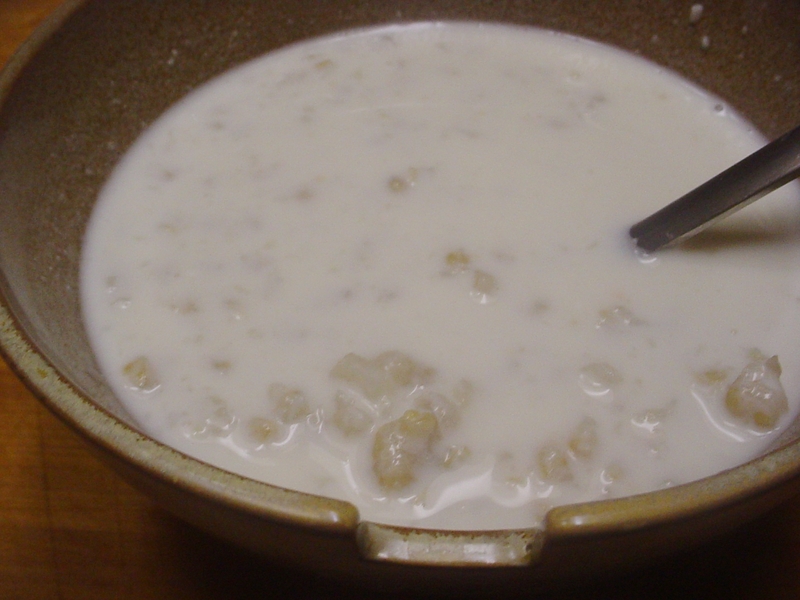 The other recipe was “M’tabla“, a cold yogurt, wheat grain and corn soup. This one is very summery and is supposed to be served chilled as a side dish to grilled or fried items (like Kibbeh) or on it’s own for a filling snack. At first both recipes were supposed to make it into the book, but unfortunately the “Makhloota” did not due to space restrictions. It really gives me much pleasure to see the simple recipe that my grandmother made and still does make it to the published work of an author such as Paula. When I told my grandmother and mom about it, they both got such a kick from it that it made waiting for years for the book to be published very much worth it. I promised I will be sending them a copy of the book as soon as I can. I barely had the chance to read through Paula’s book due to my recent (and a bit hectic) work schedule, but it is jam packed with unique and fascinating recipes from around the mediterranean. I am hoping to get to some of these pretty soon. With Paula’s permission, here is the m’tabla recipe…a bit out of season now that we are getting into the fall months but still worth making. If you stop right before adding the yogurt, you’ll have “Amhi’ah“, a thick porridge best served piping hot and mixed with a generous pat of butter and some salt. Now that is fall food. The Cooking of Southwest France: Recipes from France’s Magnificent Rustic Cuisine by Paula Wolfert. An updated classic that needs no introduction really. The Cassoulet, Garbure, Straw Potato Cake stuffed with Braised Leeks recipes alone are more than worth the price of admission. The New Portuguese Table: Exciting Flavors from Europe’s Western Coast by David Leite. 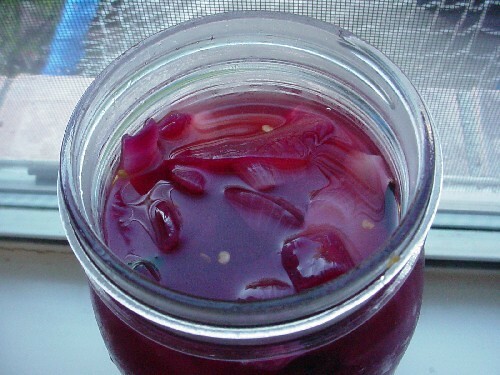 A great selection of recipes from this much overlooked cuisine. Portuguese food is rich in flavors like paprika, chilies, cilantro, garlic and spice. David also gives a very useful tour of Portuguese cheeses, wine and pantry. I really cannot recommend this highly enough. If using an electric or ceramic stovetop, be sure to use a heat diffuser with the clay pot. 1. Place the wheat and corn in a sieve and rinse under cold running water. Soak in a bowl of water to cover overnight. 2. Drain the wheat and corn and place in a 4-quart earthenware or ceramic casserole with plenty of fresh cold water to cover. Slowly bring to a boil, starting on low and raising the heat gradually. Reduce the heat and simmer for about 2 hours, or until the wheat is very soft and the corn is cooked through. Add more water if it gets too dry. By the end of the process, you should have a very thick porridge-like mixture. 3. Let the mixture cool, then refrigerate. Do not mix the yogurt into the hot wheat-corn mixture, or it will curdle. When cold, dilute the yogurt with l cup ice cold water and stir that into the soup. Add enough additional ice water to attain a thick chowder-like consistency. Refrigerate and serve this soup very cold in a tall glass…with a pinch of fleur de sel. 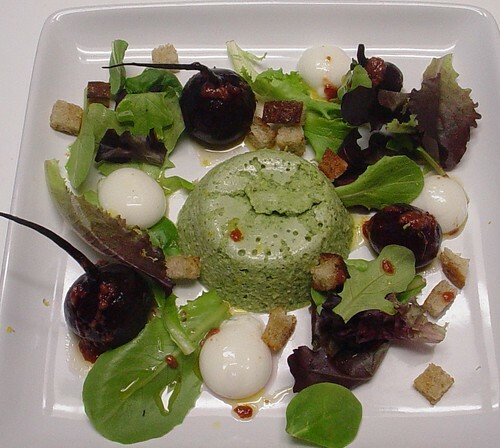 Author enassarPosted on October 29, 2009 Categories Book Recipes2 Comments on I am Published! I finally found a use to the electric convection oven we have! Let me back out a little here. See, a while back one of my wife’s co-workers was remodeling and had one of those counter top electric convection ovens. It’s kind of like those you see in infomercials only a bit bigger. She asked if Diana wanted this barely used oven and it seemed like a good idea at the time. So, we picked it up and used it maybe 2 times in the last year and half. It’s been collecting dust in the closet. Sure it does work, but it takes up counter space and I’ve never needed to use it for anything that my oven cannot handle. Until now. 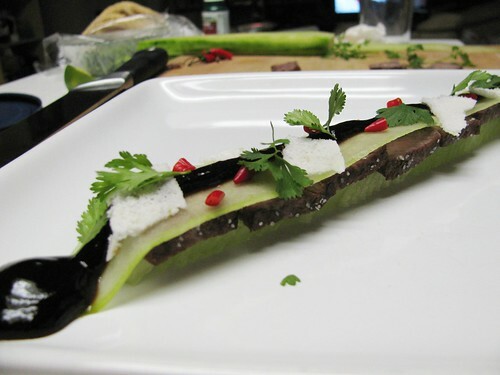 This Alinea recipe has been on my “to-do” list since I saw it on the Alinea Mosaic site, before the book was even out. 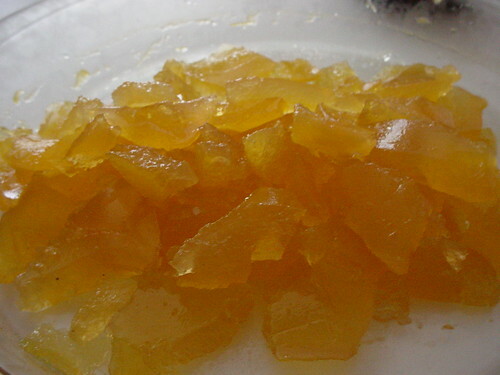 The picture looks beautiful, it seems straight forward relatively speaking and the flavor combination cannot fail. Here we have small domino-like squares of honeydew melon, topped with beef slices, a thin cucumber strip, lime sugar, soy pudding, cilantro and pink peppercorns (I used pieces of red Thai chilies instead). I made the lime sugar first. I mixed sugar, lime juice, salt, citric acid and egg white together. The recipe specifies adding a few drops of lime oil. That was nowhere to be found though so, I grated the zest of one lime into the mix instead figuring that should give the sugar a good boost of lime flavor. 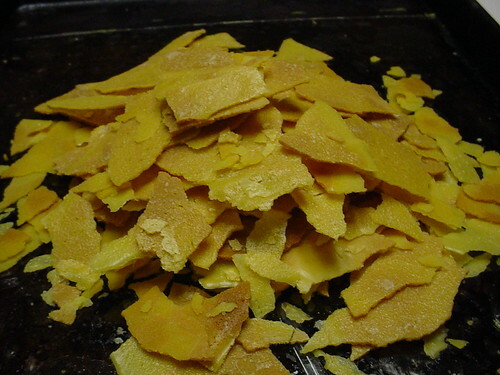 Now, the mixture is supposed to go between pieces of Teflon coated paper and into a dehydrator for 12 hours at 125F. Teflon paper? Don’t have it but I figured parchment paper should work well instead and it did. 125F?? Dehydrator? I don’t have one either. Previously I’ve managed to dry stuff successfully in my oven at about 160 or 170F. The oven does not go as low as 125F. Here’s where the convection oven came into play. It goes as low as 100F, keeps it steady AND it has a convection fan adding air to the equation. 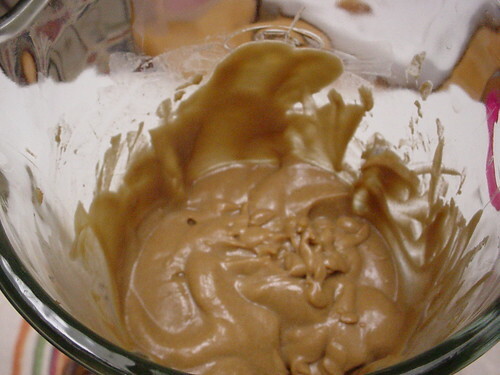 I let the mixture dry up for about 16 hours with excellent results. It had good lime flavor, it’s sweet, a bit sour with a great crunch. Lime sugar, done. The rest of the recipe was pretty straight forward. 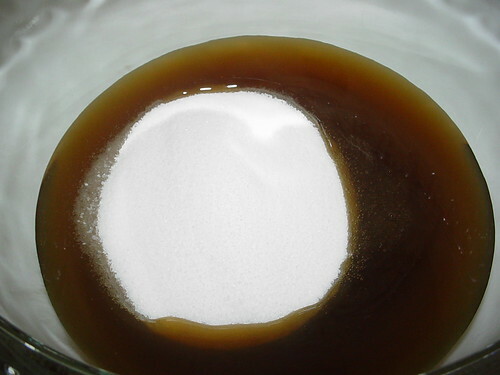 The soy pudding is made using agar. The beef is cooked sous vide, cut into strips (1x1x4 inches) and seared. At Alinea they use Wagyu (American Kobe) beef cap. I used best quality prime ribeyes instead. 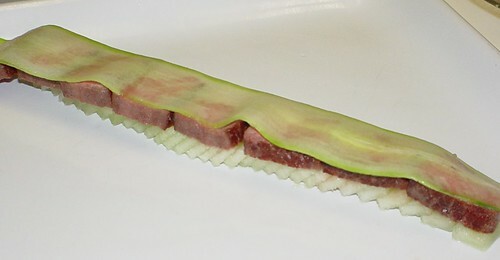 I used a peeler to make the thin cucumber strips. This was delicious. The taste was even better than I expected and the textures worked great. The rich beef has very little seasoning, but the salty soy pudding, the heat from the chilies and the sweet sour fragrant crunch of the lime sugar balance that perfectly. This combination is defintily worth making again whether in a fancy preparation like this or in a simpler presentation. I’ve never cooked venison. Sure, I have used sausage made with venison, but never a nice piece of backstrap. So, when a friend of ours was kind enough to give us some of that tender lean cut of deer, I knew I would cook it for a special occasion for Diana and I. This past weekend was our 8 year anniversary, a special occasion for sure. I had seen this recipe in Gordon Ramsay’s “*** Chef” book, that translates to “Three Star Chef” BTW and it’s the only book of his worth buying. Mr. Ramsay simply sears the venison in butter and then roasts it to medium rare. 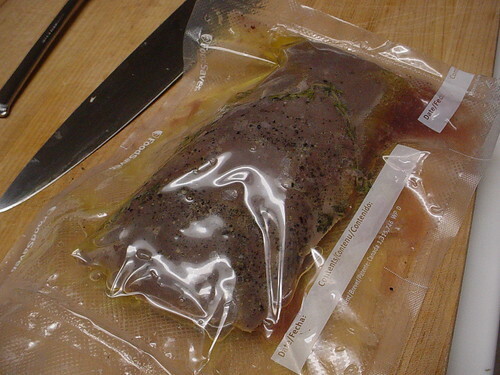 I made a change here and cooked the backstrap sous vide in my immersion circulator. This guarantees a perfectly cooked piece of meat that is not dry and cooked exactly to medium rare. I vacuum packed the meat with a bit of butter, fresh thyme, salt and pepper. I let it cook in the water bath at 135 F for about 2 hours while I prepared the meal. It really would’ve been ready in a little over an hour but that’s the beauty of this process. As long as the water temperature is at or a little below the target meat temperature, you can leave the meat in there for a good bit of time with no overcooking or drying. To finish it, I seared the meat for about 30 seconds on each side in clarified butter in a very hot cast iron pan. This was the ingredient that took the most time cooking. A long time. Like 3 hours! It was the best braised cabbage I’ve ever had though. It’s simply cooked with brown sugar, a little red wine vinegar, butter and some salt. It cooks slowly in a heavy pot with a piece of parchment on top. While the cabbage cooks, the mositure evaporates and it caramelizes slightly. Sweet, a bit tangy and not mushy. Sliced beets cooked in butter and stock until glazed and soft. I cooked diced parsnips in milk and pureed them with cream, a little butter, salt and pepper. This luscious mixture was velvety smooth and so good I could’ve eaten it by itself. 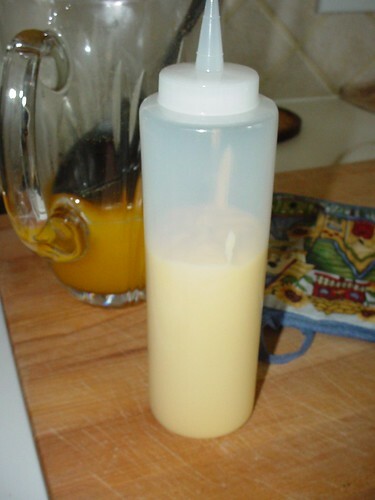 Instead it went into a squeeze bottle to be used for those cool looking parsnip puree drops around the dish. Well, Ramsay uses fresh “Cepes” here, aka Porcini muchrooms. 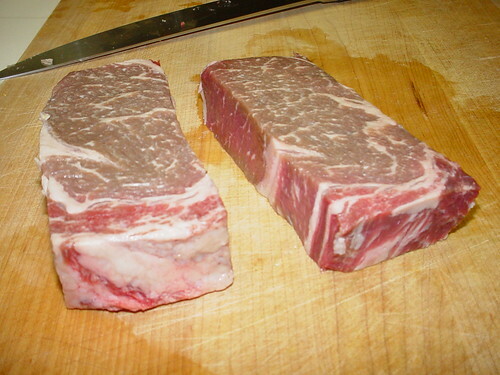 Awsome stuff if you can find them…and afford them when you do (think $40/lb at least). Instead I did what I normally do in these situations. I used plain old white shrooms and added reconstituted (soaked in warm water) dried Porcini mushrooms to the mix. The dried stuff is quiet fantastic as well and adds so much flavor to anything. Mushrooms were suteed and mixed with a little cream. I used a peeler to make very thin slices of parsnips. These were then fried until crisp. This is a classic red wine reduction made with a base of shallots and some meat scraps. In goes red wine and gets reduced. Then a pint of stock and that gets reduced too. I ended up with a rich delicious and deep colored sauce. To assemble the dish, I put a nice pile of braised cabbage in a bowl. A slice or two of beet goes on top, then the creamed mushrooms. I sliced the venison on a bias and arranged it all around. 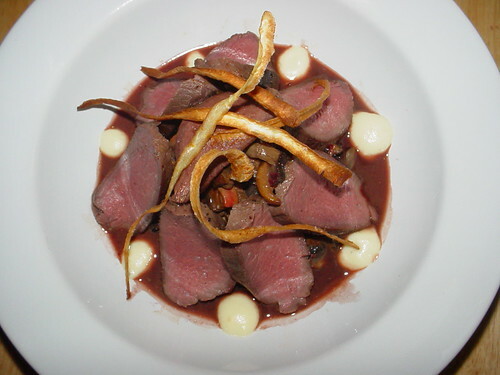 The parsnip puree goes around the venison in large dots. Very carefully I add the sauce and top the plate with the parsnip chips. Everything in the dish worked so good. 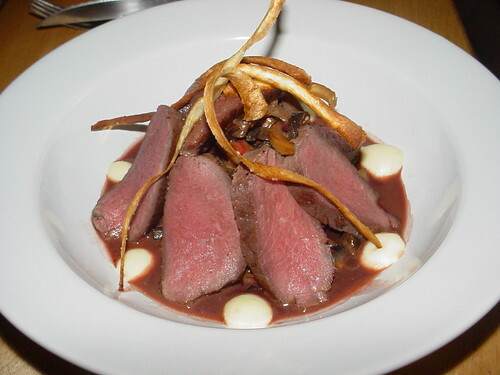 The venison was deeply flavored and tender. It stood up perfectly to the other elements of the dish and as a whole this was a special dish for a special occasion. I got those really nice baby beets from a friend who grows them in his garden and wanted to do something nice with them. What I ended up with was this cool, delicious and fancy salad. These were roasted with garlic in an aluminum foil packet. Then I carefully peeled them and trimmed them taking care to leave the thin roots intact for presentation. I made a dressing with the now soft roasted garlic. I made a Sformato with frozen peas. That’s basically a savory Italian custard that can be made with almost any vegetable from onions to butternut squash. Mario Batali has recipes for them in all his books. This one, flavored with mint, is from his Babbo Cookbook. Process is like making any custard. 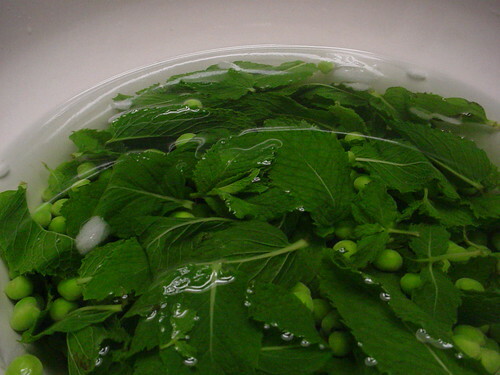 Blanch the peas and mint leaves and shock them in ice water. Puree the veggies and mix with eggs and milk. Pour in custard cups and cook in a water bath until set. I’ve used an alginate bath before to make “spheres”. Usually, some sort of liquid (beet juice for example) is mixed with Calcium Lactate and frozen in ice trays. The ice cubes are then dropped in a 10% Alginate solution to form the spheres. You end up with a thin skin of the juice filled with liquid. Pretty neat. That’s how the beet spheres here were made. However, with a Calcium rich product, like yogurt, no Calcium Lactate is supposedly needed. Just drop spoonfuls of yogurt into Alginate and you are good to go. That’s exactly what I did and it worked great. I just seasoned the yogurt with salt before making the spheres. 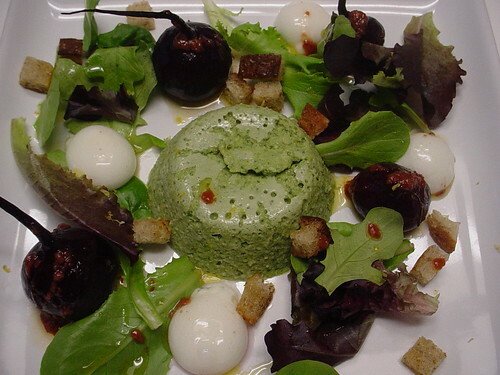 To assemble the dish I incorporated small salad greens dressed with olive oil and fresh croutons. I also grated some lemon zest on the yogurt and drizzled the beet-roasted garlic dressing on the beets. – Buckwheat ice cream. 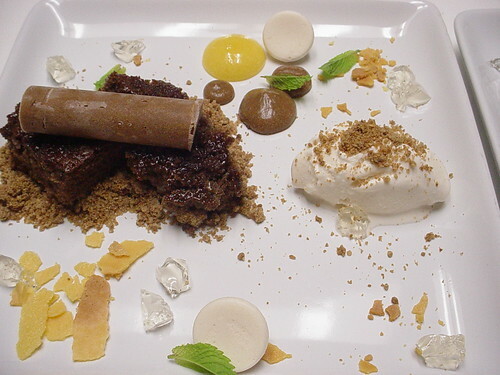 Most of Alinea’s recipes for ice cream are designed for a Pacojet. They are formulas low in fat and usually sugar. So, using a regular ice cream maker might not be a good idea since the end result is more likely to be a block of frozen cream instead of a creamy scoopable confection. Buying a very expensive Pacojet is out of the question. So, I augmented the recipe a bit by upping the fat content by using all cream and adding a few spoons of Golden Syrup. 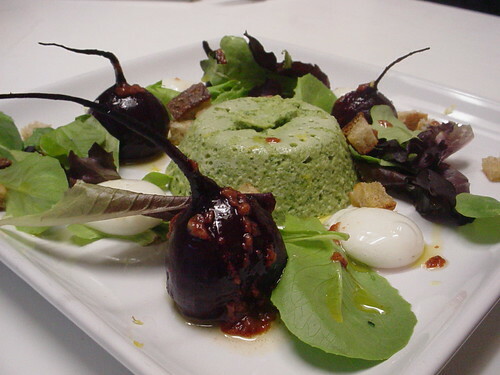 This made a nice and smooth ice cream that can be scooped and formed into quenelles. – Mint Puffs. These are made using Methocel, mint and sugar. I “dehydrated” them in my oven for a LONG time. End result was very nice though. 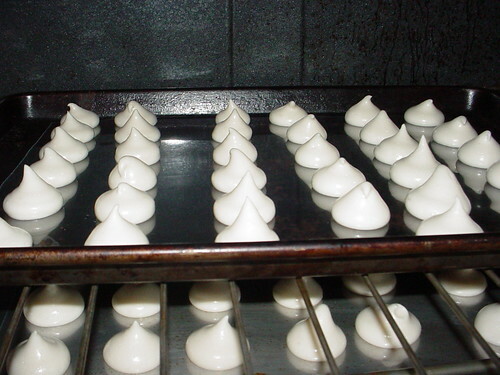 Like minty meringues without the egg whites. – Mint Jell. I used regular gelatin to set this mint extract, sugar and water mixture instead of the required Kelcogel since I had none. Seemed to work fine. Since I never had the original dish, I guess I’ll never know for sure. – Passion fruit Pudding. Passion fruit juice and sugar set with agar and then blended with Xanthan gum to a very smooth and brilliant “pudding”. It tasted amazing and looked great. I can see many desserts benefiting from similar “sauces” made with different fruits. – Coffee Cream Pudding. Made similar to the passion fruit pudding using cream and espresso. Both puddings went in squeeze bottles. – Mint Cream. The recipe asks us to use a French mint liquore called “Get 31”. It is colorless and about 21% Alcohol. Well, I could not find it anywhere. I am not even sure it is sold anywhere in the US! Instead I used another good qualtiy French mint liqoure made by Marie Brizard. This one was green though, but alcohol wise, it was pretty close at 23%. Mint, cream and sugar make up this one. IT is then frozen but with the high alcohol content it never quite freezes solid. this makes sense since this is the filling for the capsules. – Coffee Mint Capsules. As expected, this was the trickiest part of the recipe. 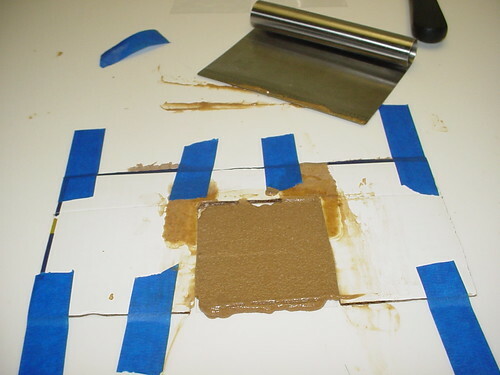 The capsule walls are made by a thin layer of the coffee pudding on acetate. 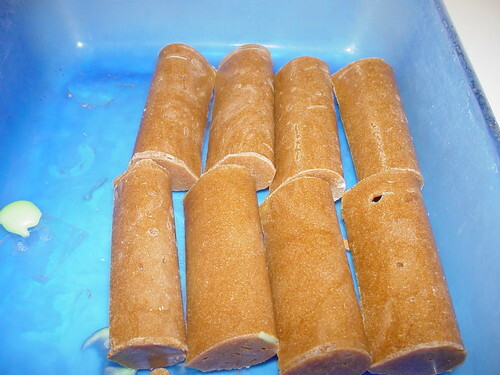 That is rolled and taped and frozen to make cylinders. In there we pour some mint cream and freeze the whole thing. I never got perfect cylinders, but I am pretty pleased with the end result. Thank goodness for the make shift “mold” I made. If it wasn’t for that, no way would I been able to make even layers of pudding on acetate. – Coffee Cake. This is fairly standard, flavored with coffee extract and cocoa and baked in a sheet pan. – Buckwheat Streusel. Buckwheat flour, almond flour, all purpose flour, brown sugar and butter. It’s baked and crumled. 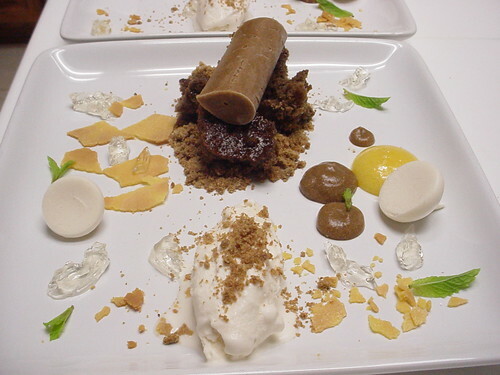 The final result was an delightful mix of delicious flavors, textures and temperatures. Who knew coffee, buckwheat mint and passion fruit go so well together. I might never make this dish in all its components again, but it was a useful learning experience and many of these subrecipes will be showing up again in one form or another in my dishes.